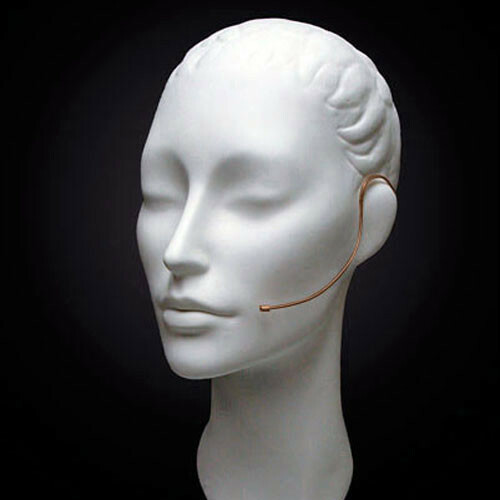 The Countryman E6 Omnidirectional Microphone is a miniature ear-set microphone for virtually invisible operation in stage performances, trade shows, houses-of-worship, auctions, lectures and much more. The omnidirectional version effectively minimizes rubbing and handling noise often associated with cardioid lavaliers while providing a wide pickup area around the perimeter of the capsule. Flexible microphone positioning is maintained and the included windscreen minimizes wind noise. The E6 is set apart from the E6i with its stiffer flexible boom. The flexible boom maintains its shape for custom, single-user size adjustments. A wide variety of colors and connections are available for use with various wireless transmitters. This version is cocoa and the cable terminates to a 3-pin XLR connector for direct connection to microphone preamplifiers, mixers, etc. The omnidirectional polar pattern is effective in minimizing the handling and surface noise often associated with cardioid capsules. The flexible boom provides a stiff fit that maintains its shape for single user applications. This version is optimized to be most effective at reproducing signal without overload and distortion. -20dB headroom allows placement at close proximity to the mouth for capturing singing or loud speech without noise and distortion.